In an effort to help more educators reach their goal of becoming a Google Certified Educator Level 1, Level 2, or Google Certified Trainer, I have put together this Google Certification FAQ to answer your most frequently asked questions. I get so many questions about Google Certification that I decided to put together this dedicated post that answers the most frequently asked questions. Some of the questions below are also answered in a video format, and I have embedded those here for you. If you questions aren’t answered below, be sure to leave a comment at the bottom of this post! Remember, the Google Certification Courses only open twice a year! Enrollment is open until Dec. 4, 2018! They will not open again until May 2019. In this webinar, you will learn all about each of the certification options and requirements. This webinar is free, and on-demand, so you can choose a time that is convenient for you! Google Certification FAQ – Your Questions Answered! This page is quite extensive and covers both Google Certified Educator questions and Google Certified Trainer questions, as well as questions about the Shake Up Learning Google Certification Courses. Use the anchors below to jump to a section. There are four different certifications offered by Google for Education. 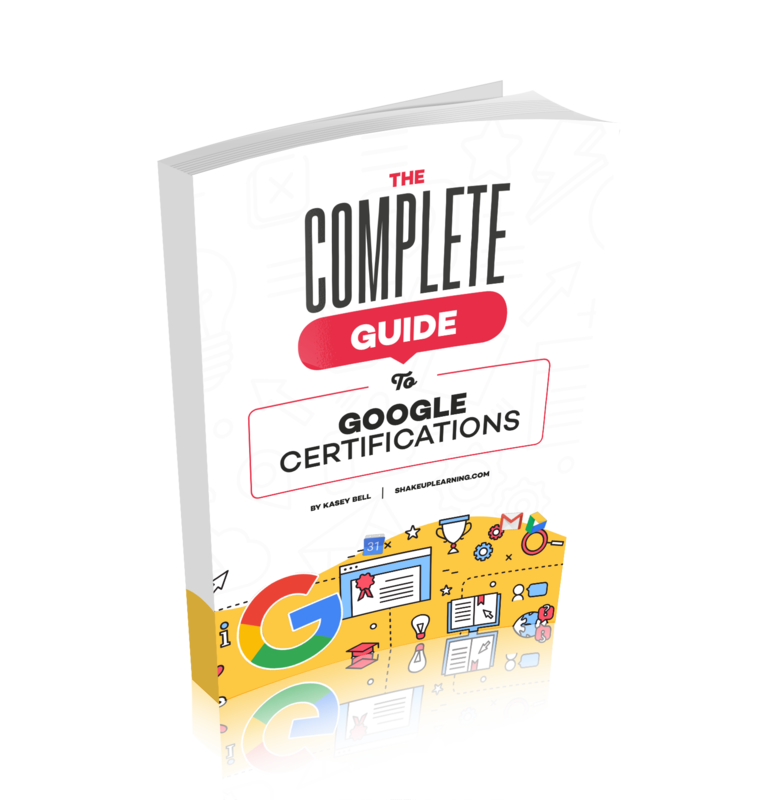 You can learn all the details of each program in my free ebook: The Complete Guide to Google Certifications. Google Certified Educator Level 1 and Level 2: Designed for educators and classroom teachers who wish to demonstrate proficiency in using Google for Education tools. The Level 1 status indicates that an educator is able to successfully implement G Suite for Education into their teaching practice in order to enhance teaching and learning. The Level 2 status indicates that an educator is able to successfully integrate a wider range of Google for Education tools and other technologies in order to transform their teaching practice. Google for Education Certified Trainer: Google for Education Certified Trainers are passionate and driven education professionals with a desire to help others transform classrooms with technology. Whether you are a school’s go-to technologist, a stellar classroom teacher or an enterprising consultant, anyone is welcome to apply for membership in the program. Google for Education Certified Innovator: Designed for education thought-leaders who create new and innovative projects using Google for Education tools. Innovator will not be addressed in the Q&A below. To learn more about Innovator, check out 5 Tips to Become a Google Certified Innovator. What are the benefits of becoming Google Certified? There are many benefits to the certification program. As a Google Certified Educator Level 1, you will become more proficient with G Suite tools and learn how to integrate technology meaningfully in your classroom. As a Level 2, you will become more of an expert with G Suite and learn how to integrate a wider range of tools. As a Google Certified Trainer, you will learn how to create engaging presentations and presentation materials, as well as have the opportunity to take your career to the next level. You can learn more about all of the benefits in this post, infographic, and video, 10 Reasons to Become a Google Certified Educator. Do you have to be a classroom teacher? No, you do not have to be a teacher in a classroom or even employed in education to take the exam. However, the exam and the training materials are designed with classroom teachers in mind. Yes, even pre-service teachers can get certified! The time required totally depends on the type of certification you are reaching for and YOUR skills! Everyone is different so it’s not a simple answer. For L1 and L2, use the capacity matrix to self-assess where you are and how much you need to learn (Download Level 1 Capacity Matrix here, and Level 2 Capacity Matrix here.). Becoming a Google Certified Trainer can take much longer and depends on your experience level as a trainer and how much time you need to build your resume. How long does certification last? How long is it good for? The Google Certified Educator Level 1 and Level 2 certifications are valid for three years. The Google Certified Trainer certification requires that you meet yearly requirements, (1) report a minimum of 12 trainings per year, (2) upload resources to the shared resource database, (3) take a yearly product update exam. Do you have to be a Level 1 before going for Level 2? No. Level 1 is certification is not a prerequisite for Level 2. If you want to skip Level 1 and go straight to Level 2, you can. However, if you plan on pursuing Google Certified Trainer, you will need both Level 1 and Level 2. How much do the Level 1 and Level 2 exams cost? The Level 1 exam is $10 and the Level 2 exam is $25. To learn more about the exam and get insider tips, download my free ebook: How to Pass the Google Certified Educator Exams. Both Level 1 and Level 2 exams are timed. You have 180 minutes to answer a combination of matching, drag-and-drop, and performance-based scenario questions. The performance-based questions require that you perform tasks inside a special G Suite domain. (You receive special login credentials after you register for the exam.) You will be asked to create, share, and complete tasks in G Suite to demonstrate your knowledge and skills. To learn more about the exam and get insider tips, download my free ebook: How to Pass the Google Certified Educator Exams. Google is a forward-thinking company and doesn’t believe in locking down the outside world while you take your exam. You can and should open other tabs during your exam to double-check your answers using every tool at your disposal, including the Google Support Center and other resources that you used to study. However, keep in mind, it is a TIMED TEST. You cannot Google every answer. You gotta know your stuff! Any of the exams, Level 1, Level 2, or Trainer Skills Assessment can be taken at anytime. Be sure you register at least 48 hours ahead of when you plan on taking it to insure you get your login credentials in time. Get more tips like these in my free ebook: How to Pass the Google Certified Educator Exams. What is the #1 reason that people fail the Google Certified Educator exam? The number one reason that educators fail the Google Certified Educator Level 1 or Level 2 exam is that they ran out of time and didn’t answer all of the questions. Both exams are times, 180 minutes each. Just like we tell our students, you must not spend too much time on one question. If you don’t pass an exam, you can take it again after 14 days. If you don’t pass a second time, you must wait 60 days before you can take it a third time. If you don’t pass the third time, you must wait a year before taking it again. Payment is required each time you take an exam. You will not receive specific feedback from Google on what exactly you missed, but in most cases, you know where you struggled, took too much time, and what you need to study before taking the exam again. How much harder is the Level 2 exam? If you have taken the Level 1 exam, you are halfway there. Just learning how to use the testing system itself is half the battle! The Level 2 exam is structured and time just like Level 1, but the content goes deeper and is more advanced. Expect more advanced skills in the core G Suite apps, and a wide arrange of lesser-known tools to be on the Level 2 exam. To see exactly what’s on the Level 2 exam, see this post: What You Need to Know to Pass the Level 2 exam? After your 3-year certification has expired, you will be required to take the exam again to recertify. How much time does it take to become a Google Certified Trainer? It varies for everyone! It depends on your level of expertise and how many of the steps you have completed. It also depends on your experience level as a trainer, and how much time you need to build up your resume. I recommend you review this article that includes an infographic and video of the 6 Steps to Google Certified Trainer. In addition, you may want this FREE ebook: How to Become a Google Certified Trainer. Do I have to already be a trainer before I apply to become a Google Certified Trainer? You must demonstrate that you have proven experience training on Google tools in schools. Your role doesn’t have to officially be as a trainer, but you will be required to prove you can meet the minimum of 12 Google trainings per year. Do my trainings have to be large group, or can I count 1-on-1 or small group? You can count your more informal training sessions with one or more participants when you report your trainings to Google. However, it is recommended that you have more formal experience with large groups and at conferences included in your application. How often do Google Certified Trainers travel to other schools? This depends on what you want to do! Google doesn’t assign you any training jobs. Your only requirement is to meet the minimum 12 trainings per year. Where you do that is up to you. How much is the trainer exam (Trainer Skills Assessment)? The trainer essentials exam is $15. The exam consists of 25 multiple choice and matching questions. You will have 90 minutes to complete the exam. Is the trainer exam more difficult than Level 2? No! 25 multiple choice questions. There are many requirements for the application, including your Level 1, Level 2, and Trainer Skills Assessment certificates, an application video, and sharing feedback and materials from your training sessions. You can learn more in this post and video about everything they ask for in the application: Everything You Wanted to Know About the Google Certified Trainer Application. What was the hardest part of becoming a trainer? This will vary depending on who you ask. For me, it was the exams and application video. We all have different strengths and weaknesses. For the tutorial video, should I keep it simple or are they looking for creativity and innovation? Don’t go simple! Show off your mad Google skills! Do I have to be an expert with using Google before taking the trainer course? No, you can take the exams in any order and the trainer skills assessment is about training strategies and best practices. GCE Level 1 & Level 2 is where you will learn how to beef up your Google skills. If my application is not approved, is there a way I can find out what I need to improve on for the next wave? Not typically. But most often it is lack of experience or not sharing your video and documentation correctly so that the evaluators can view them. Be sure that you have demonstrated that you have proven experience delivering Google-focused training and can meet the 12 trainings per year requirement. The Google Certified Trainer certification requires that you meet yearly requirements, (1) report a minimum of 12 trainings per year, (2) upload resources to the shared resource database, (3) take a yearly product update exam. No. The Google Teacher Center is great and offers some support to help you prepare, but it’s not the solution for every learner. I wrote some of the lessons for Google so please do not think that I am criticizing. There is a reason why so many people look for more support, face-to-face training, and online training. The training offered in the Google Teacher Center is mostly text-based and doesn’t provide step-by-step tutorials. It’s great if you don’t need that and can learn on your own, but if you want more my courses can help! How long are the Shake Up Learning courses? Level 1: Over 15 hours of video learning, however, it is self-paced. You can also speed up or slow down videos. Level 2: Over 8 hours of video learning, again, it is self-paced and you can control the videos. Trainer: Around 6 hours of video learning, but requires much more time to prepare for the application, create the video, etc. It is a completely self-paced online course – you decide when you start and when you finish. No meeting dates! Google changes all the time. How often will this course be updated? Is there credit for the course? Each of the courses offers a professional learning certificate of 12 credit hours at the completion of the course. There is no college credit or CEUs, just a general certificate that you can print and share with your supervisors or administration. Google Certification Courses Open Nov. 20 – Dec. 4, 2018! Google Certification FAQ - All Your Questions Answered! In an effort to help more educators reach their goal of becoming a Google Certified Educator Level 1, Level 2, or Google Certified Trainer, I have put together this Google Certification FAQ to answer your most frequently asked questions. I get so many questions about Google Certification that I decided to put together this dedicated post that answers the most frequently asked questions.